Carbinite’s founder and CTO, Rob Freyvogel, is a high-performance automobile enthusiast. From autocross to drag racing to road racing to land speed racing, Rob has designed, modified, and built cars that push the limits. Understanding that even the smallest variable can make a difference, he developed coating solutions that can improve automobile performance both on and off the track. Coating your Automotive Supercharger Pulley or Marine Pulley with Carbinite’s coating may reduce belt slippage, increase boost, increase HP and torque, and eliminate the need for cogged conversion. Our Chassis Dyno Traction Enhancement improves traction, increasing the precision of your readings. Carbinite is a cost and time-efficient alternative to thermal sprays or dyno drum reknurling, and when applied on-site can reduce your downtime. All serpentine belt drives suffer from some amount of slippage. Sometimes the slippage problem is amplified by smaller diameter pulleys, limited belt-to-pulley contact areas, and high accessory loads. 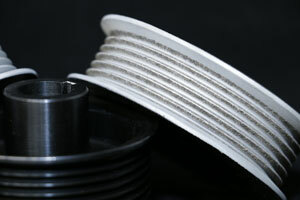 Carbinite’s unique textured coating provides optimal grip for serpentine belt systems, reducing or eliminating belt slippage. This set-up allows for more power to be transferred through the serpentine belt system. The textured carbide coating, optimized for grip and belt life, is metallurgically bonded to your pulley and is guaranteed not to chip, flake or peel. The coating can be applied to all serpentine applications from street cars to race cars, as well as to high-performance marine pulleys (water pump and/or supercharger). Carbinite can be applied to steel or aluminum pulleys. You may see an improvement in your boost level. Carbinite can eliminate the need for a 6-to-8 or 8-to-10 rib conversion. In some cases, Carbinite can eliminate the need to go to a “cogged” set-up. What will happen to my pulley? Couple a high HP car with worn knurls on a chassis dyno, and wheel spin can become a major problem leading to inaccurate results and safety hazards. 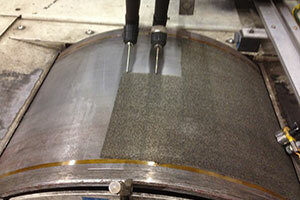 Applying Carbinite’s textured coating to your worn chassis dyno drums can eliminate this issue. Carbinite’s Dyno Drum Refurbishing coating can be applied on-site without drum removal to minimize your downtime. Drums do not need to be rebalanced after coating. Our Carbinite coating is a long-lasting hardened material, metallurgically bonded to your chassis dyno drum. It is guaranteed to not crack, chip, or peel. It is usually a more cost-effective and time-efficient solution to worn drums than drum replacement.